The Hayward booster pump uses up to 40% less electricity than other booster pumps and is remarkably quiet. Suitable for any pressure cleaner requiring a booster pump it's designed with a tall mounting base for increased motor ventilation and flood protection. The Hayward Booster Pump is a high performance, exceptionally quiet booster pump that users either 1 1/2" unions or 3/4" fittings that makes installation and service easy while using up to 40% less electricity. 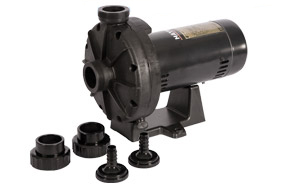 This booster pump is an excellent replacement for any 3/4 HP booster pump and is equipped with a tall base for increased motor ventilation as well as protection from flooding. • Uses up to 40% less electricity than other booster pumps. • 1 1/2" plumbing union fittings improve performance and allows easy installation and removal. • 3/4" hose barb union adapters allow for easy retro fit to existing installations using flexible hose for booster pump connections. • Suitable for all pressure cleaners requiring a booster pump. • Tall mounting base allows for increased motor ventilation as well as protection from flooding. • Volute may be re-oriented in the field for horizontal discharge. • Drain plug requires no tools for installation and removal. Reward Points 266 points will be rewarded to you when you buy this item.